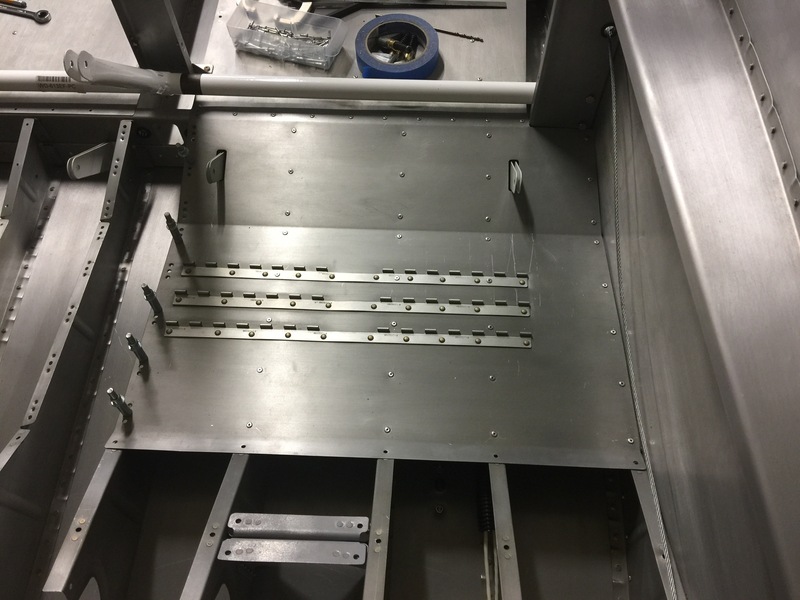 Today I spent a few hours prepping the aft seat pans for riveting. I wanted to install the two remaining antennas on the underside of the fuse. This includes the transponder and ADSB antennas. Both are blade style antennas. I used the provided templates to ensure alignment. And I centered the antenna between the two seat ribs in each case. I then installed the two antennas and torqued the nuts. Here you can see the two antennas mounted. 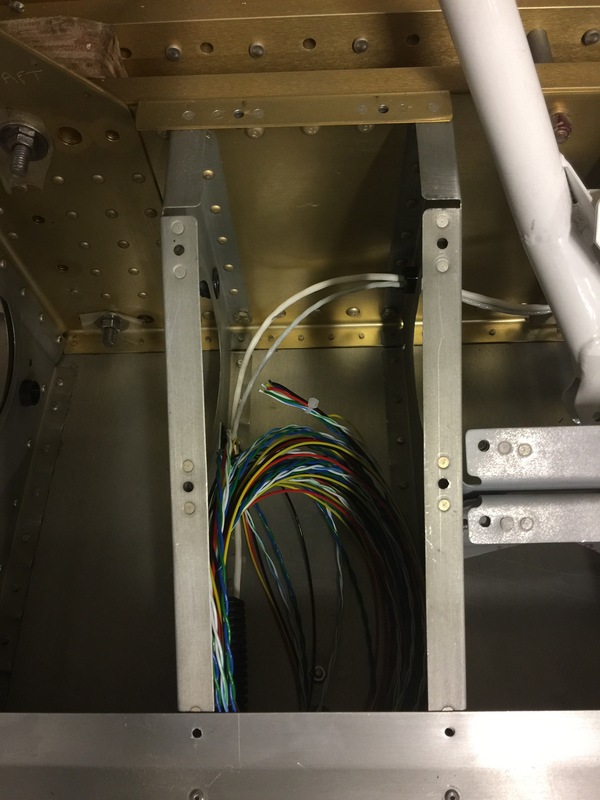 I will install the BNC connectors once I know where the wires will route. 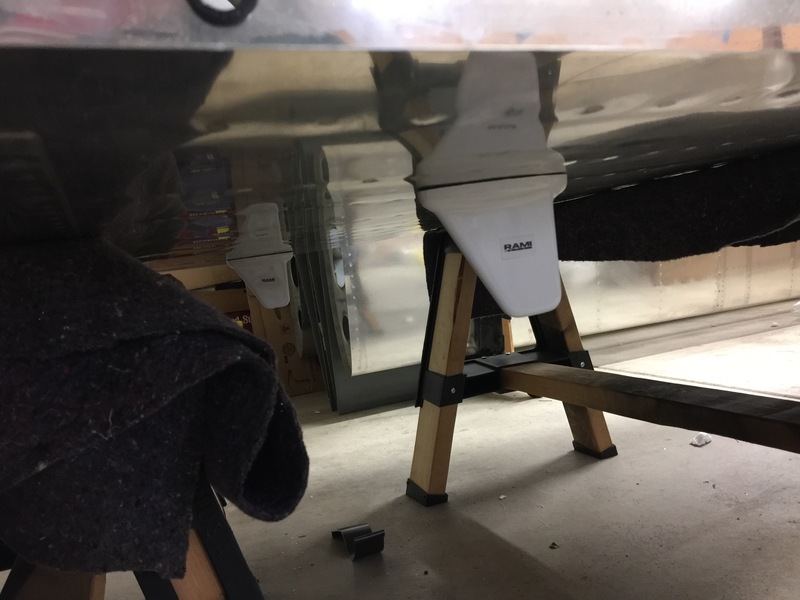 Now that the antennas were installed I began final prep for riveting the seat floors. I began by vacuuming out all the debris from the drilling and then clecoed the seat in. 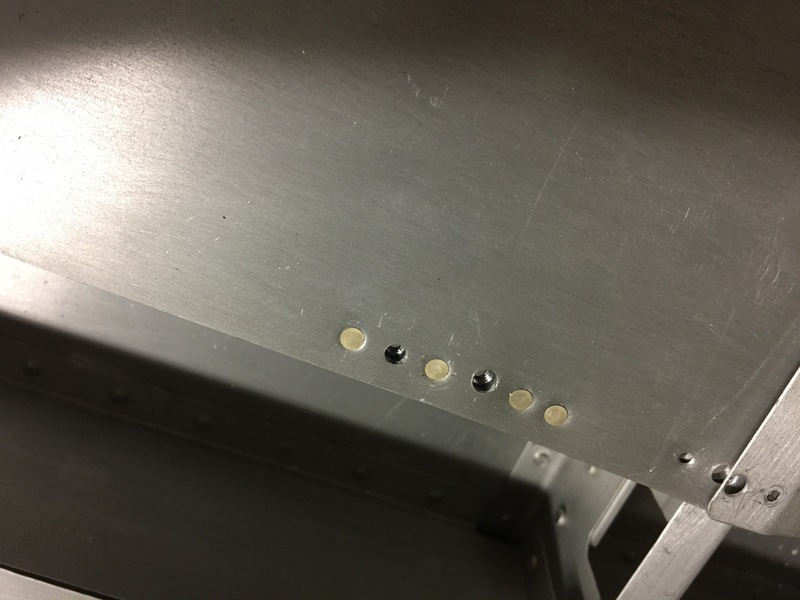 I then used LP3-4 pop rivets to rivet the seat floor in. I also installed the crotch strap brackets which can be seen at the bottom of the picture. Here is the picture during the drilling. I used two 1/8th” drill bits to ensure the spacing was correct. I drilled the brackets to the ribs and then disassembled and deburred, primed, and then riveted the assembly in. I took a break from riveting and wired up the pitch autopilot servo. I then ran the wiring harness through the conduit under the seats and stored the wire there for now. I also ran the wire to the tail for the rear position/strobe light, and the elevator trim servo. 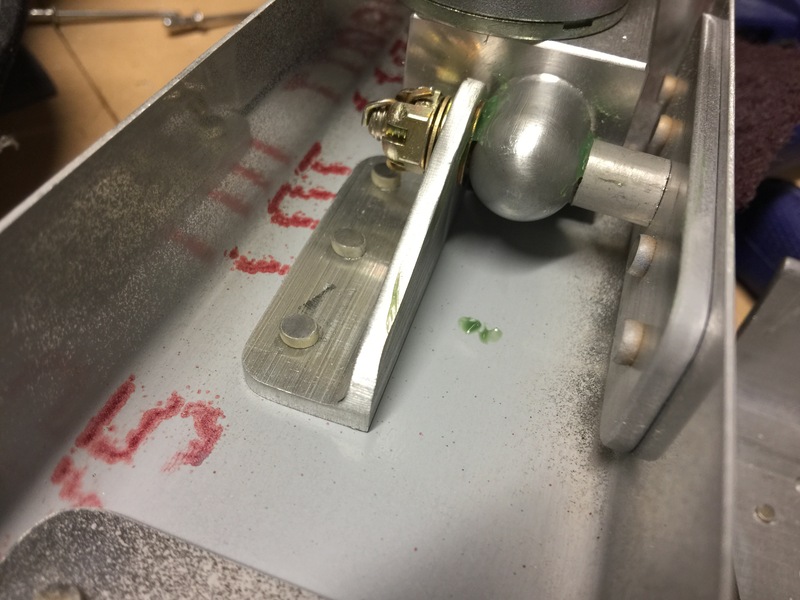 Once I install the elevator it will be a quick hook up to the servo and a few wires for the tail light and the wiring will be done in the aft fuse. Here’s the autopilot servo wire bundled. 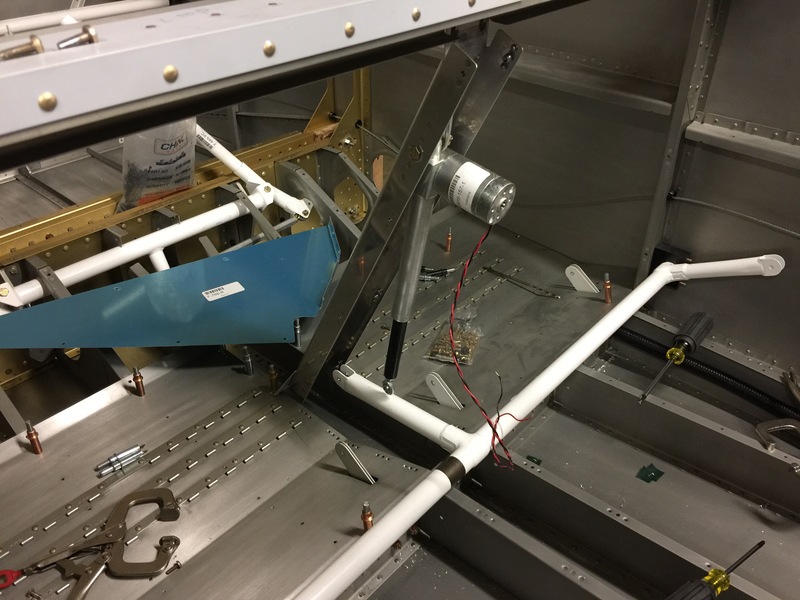 Also the two white wires are routed inboard and forward to the forward fuse in front of the spar. These will route up to the panel. Tomorrow I’ll put in the copilot’s seat floor and then begin work on the center tunnel between the two seats. This weekend I spent some time working on some more fuse work. I started by assembling the elevator bellcrank. Once I match drilled the parts together I measured and drilled the hole for the autopilot pushrod. I then disassembled and primed all the parts and riveted it together. 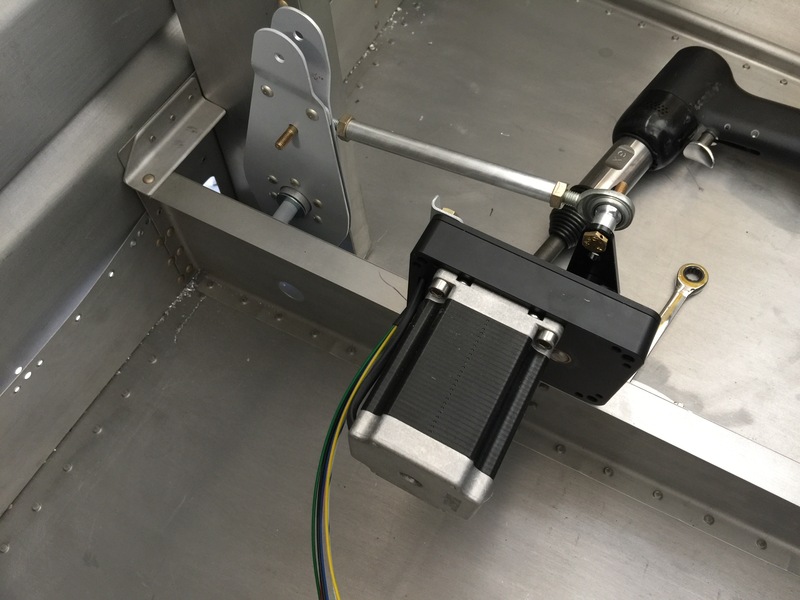 I also installed the autopilot servo temporarily to measure and align the pushrod. 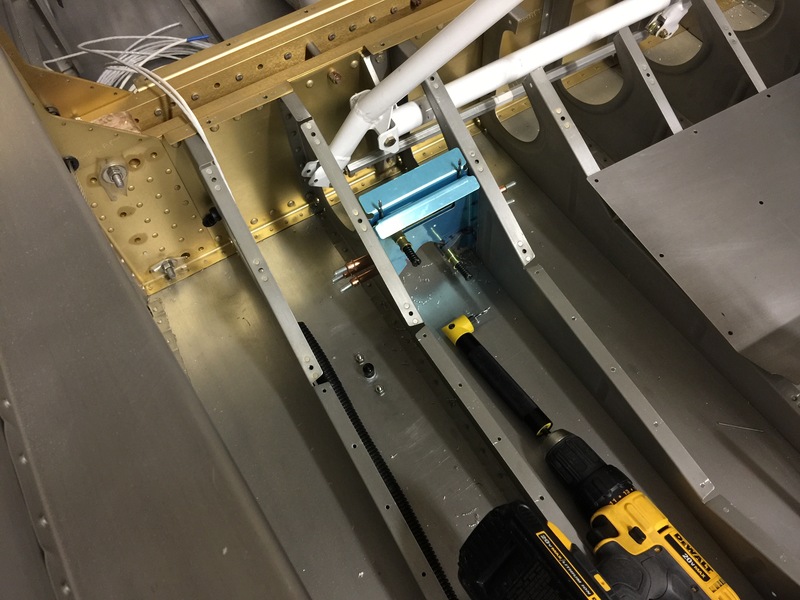 I then measured and installed the comm antenna just behind the auto pilot servo along the aircraft centerline. 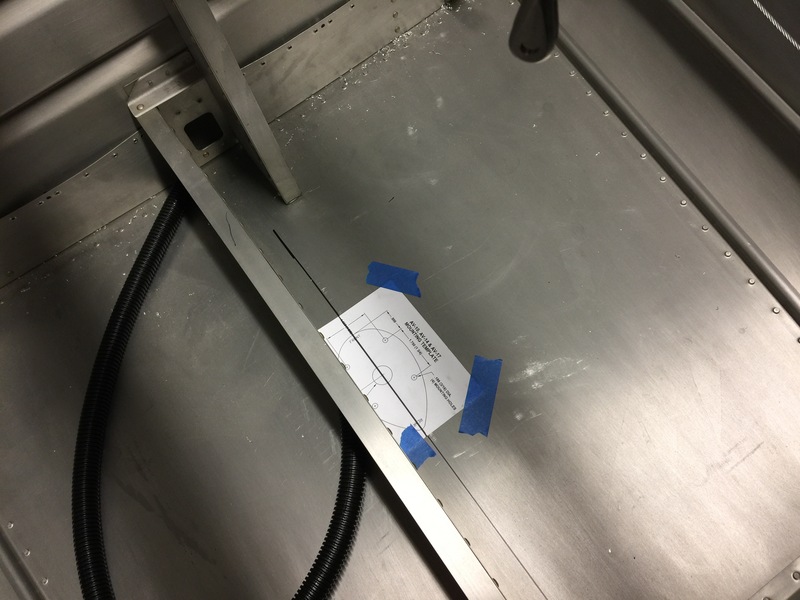 I modified the doubler plate to fit next to the center support. I’m debating whether or not to add another support to stiffen the area a bit more. 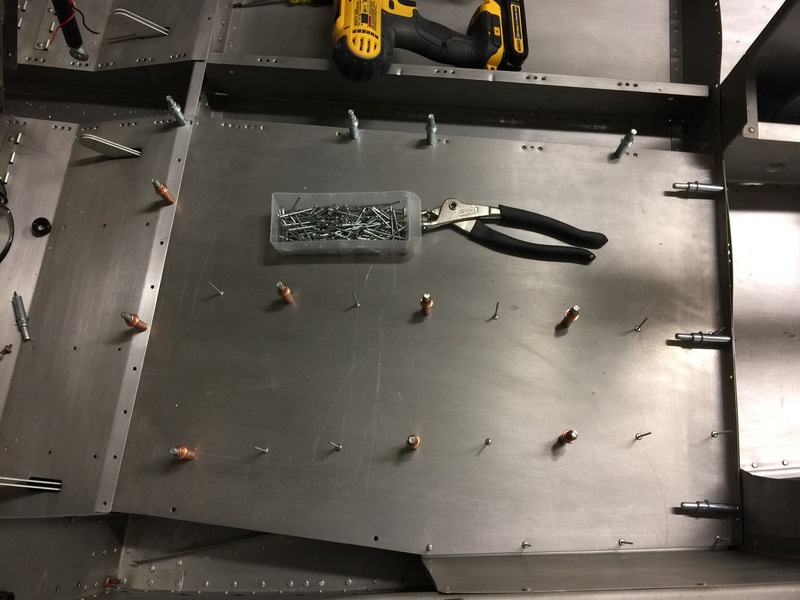 I then prepped the baggage floors for riveting. I cleaned out the area under the floor with my vacuum as well as secured the wiring conduit. 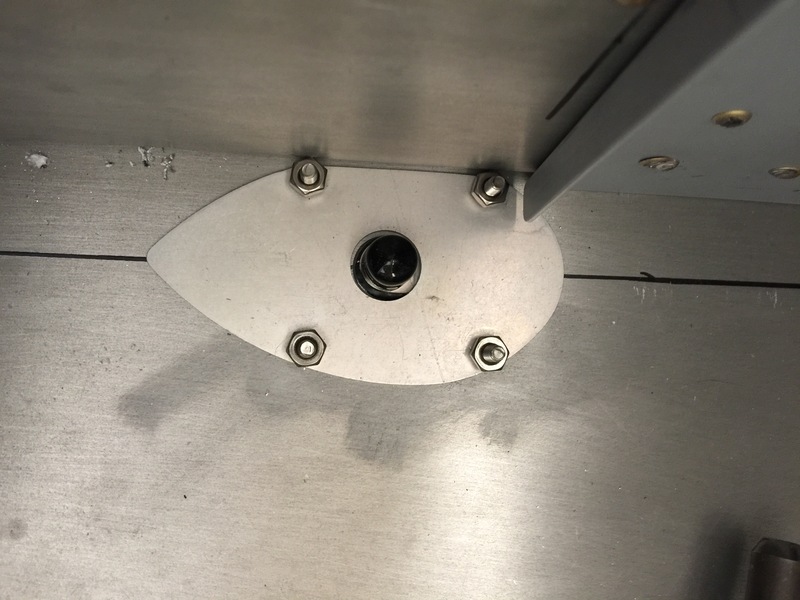 Here you can see the floor clecoed in with the LP-4 blind rivets ready for installing. The center tunnel cover is installed here, so platenuts are installed to allow the cover to be removable. You can also see the platenut I installed for the flap center bearing block attachment bolts. 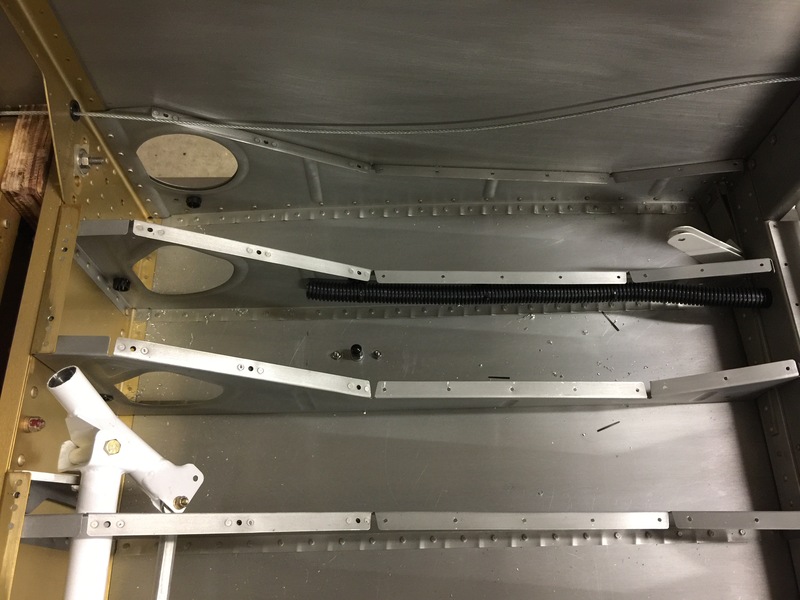 Here are the aft platenuts and rivets that hold the floor to the baggage bulkhead. 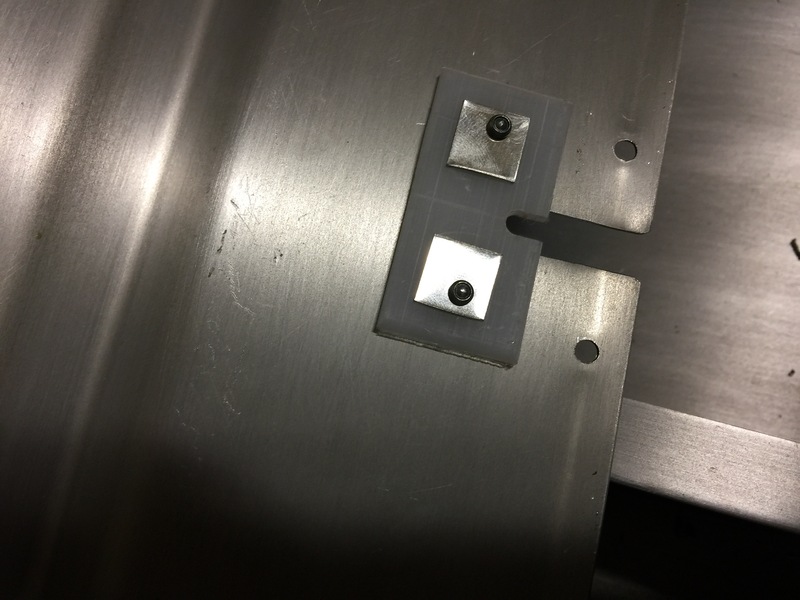 The baggage panel covers screw to these platenuts. The right side floor is prepped and ready for installation. I got several orders from Aircraft Spruce in the mail today including 3 of the antennas I’m going to use in my plane. One is the Comm radio antenna. 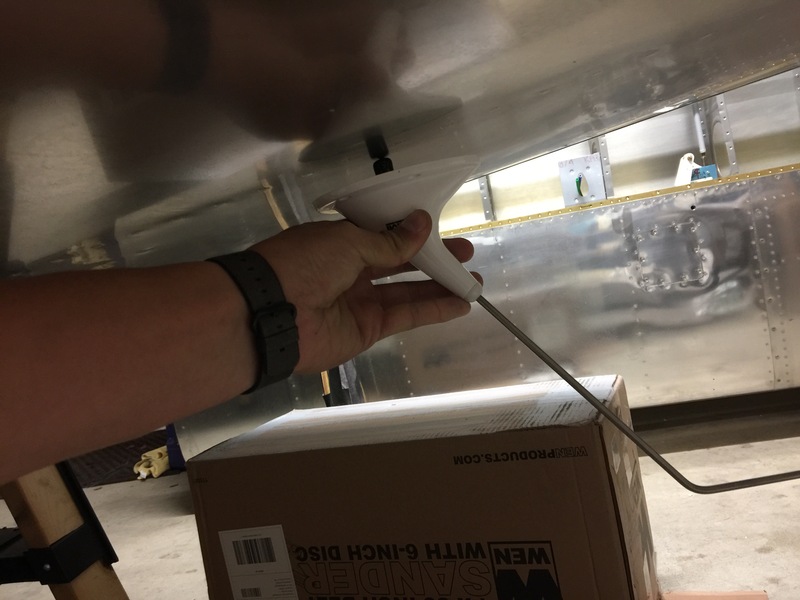 It’s a “bent whip” style antenna that will mount to the underside of the plane. 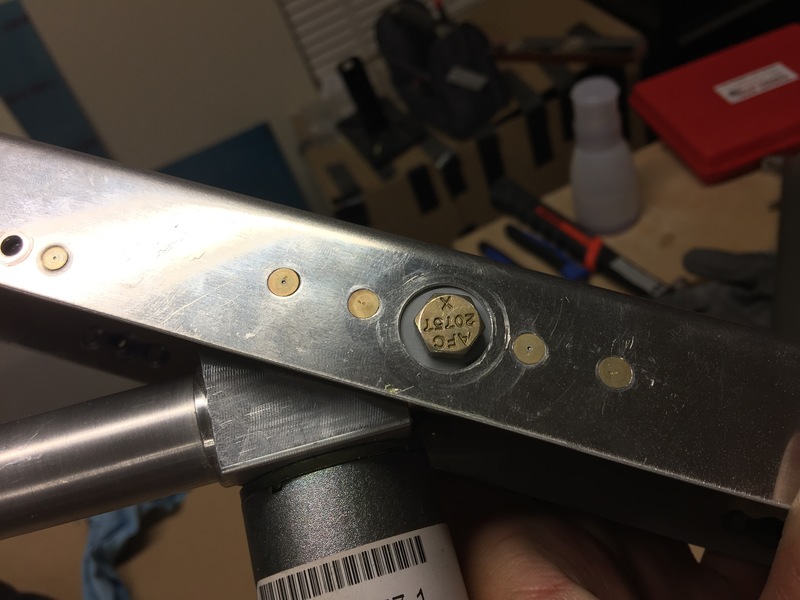 I measured and marked the center line in the fuse behind the baggage bulkhead. The reason I decided to mount it here is that it’s just aft of the elevator bellcrank. 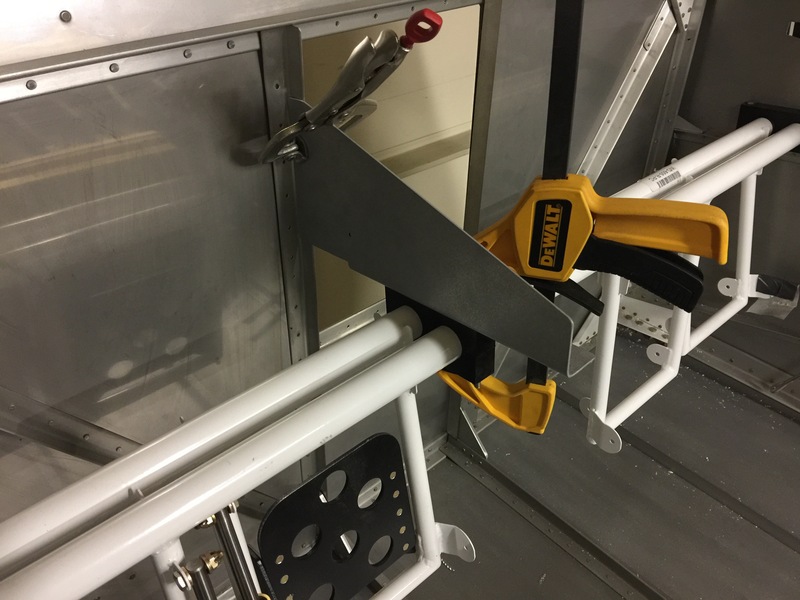 It’s the closest forward I can mount it on the centerline of the fuse without dealing with the elevator pushrod that runs through the center. 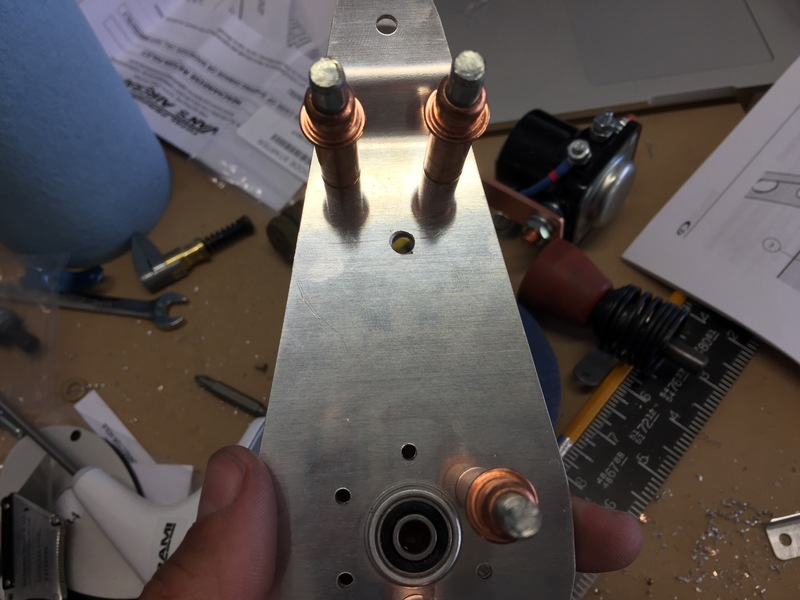 It’s externally mounted with 4 screws and is connected to the radio with a BNC connector and some rg400 coax. 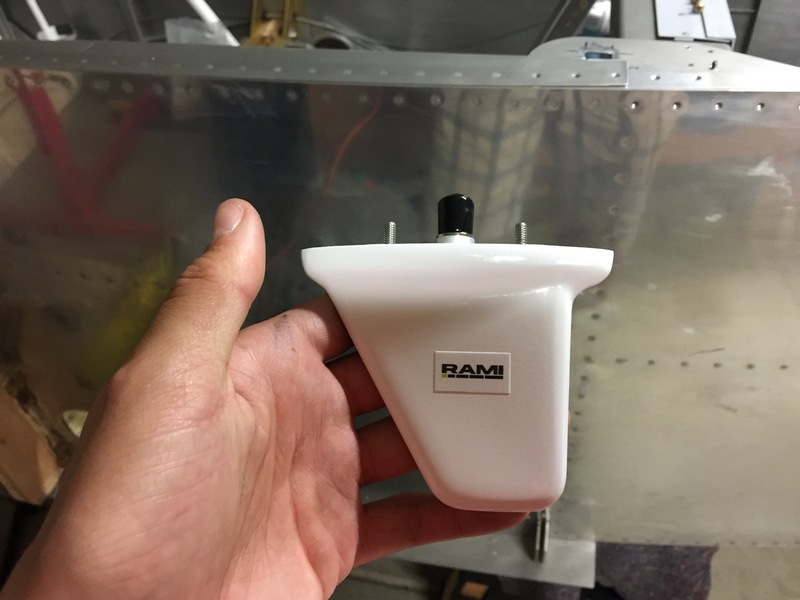 The other two antennas I got are for the ADSB (978mhz and 1090mhz) and the transponder (1090mhz). 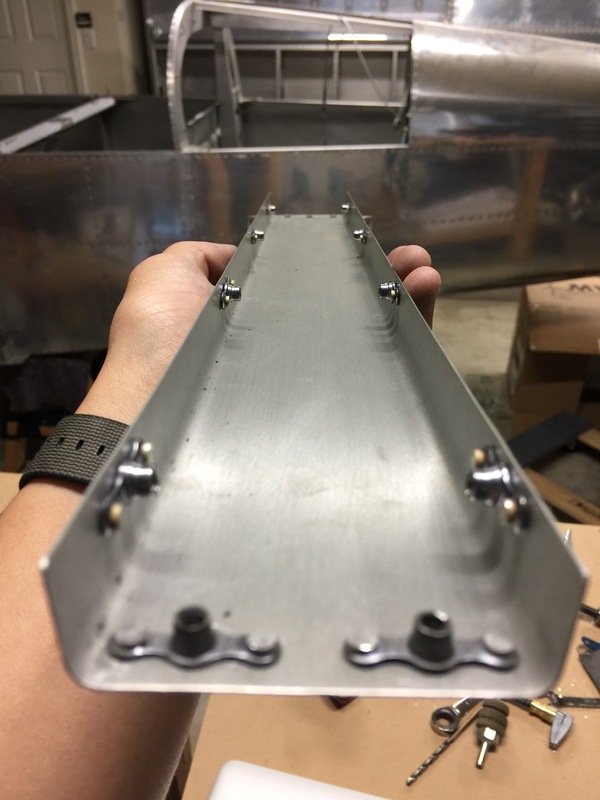 They are identical in design and will be mounted symmetrically under the pilot and copilot seats from the underside of the plane. Once I get these two blade antennas mounted I can rivet the seat floors to the fuselage. 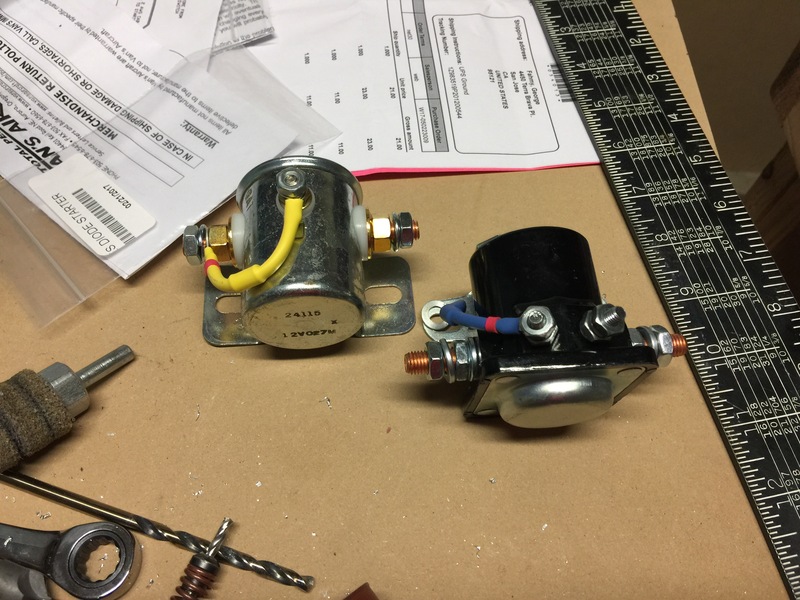 I also received my Andair fuel pump. It will mount just forward of the seats below the fuel selector valve. I also got an order from Vans with my master relay and my starter relay. The silver master relay will connect to the battery and to the master switch. 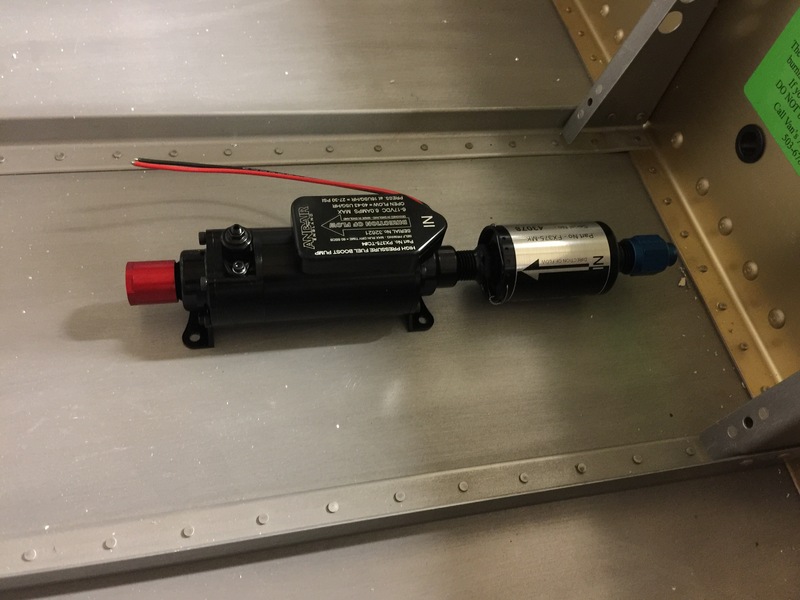 It will provide direct power to the starter relay and to the rest of the plane. The starter relay has an intermittent duty cycle and will provide power to start the engine when the starter button is pressed. 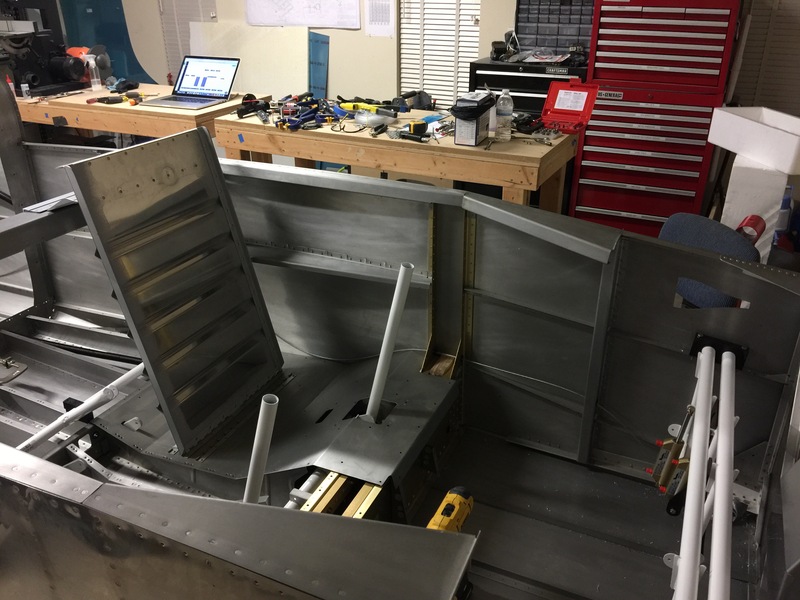 Today I spent a few hours doing some more work for the flap installation as well as work on the baggage bulkhead. 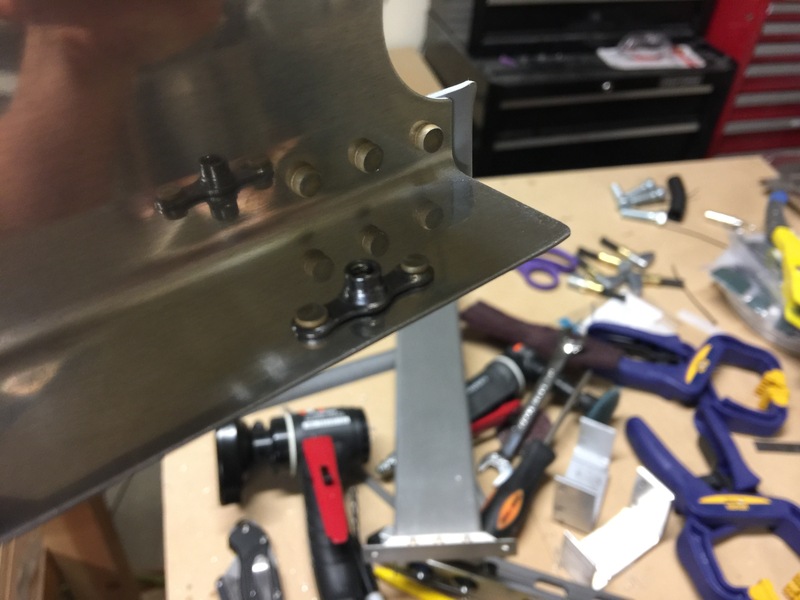 I started by riveting all the nutplates to the rear channel support. 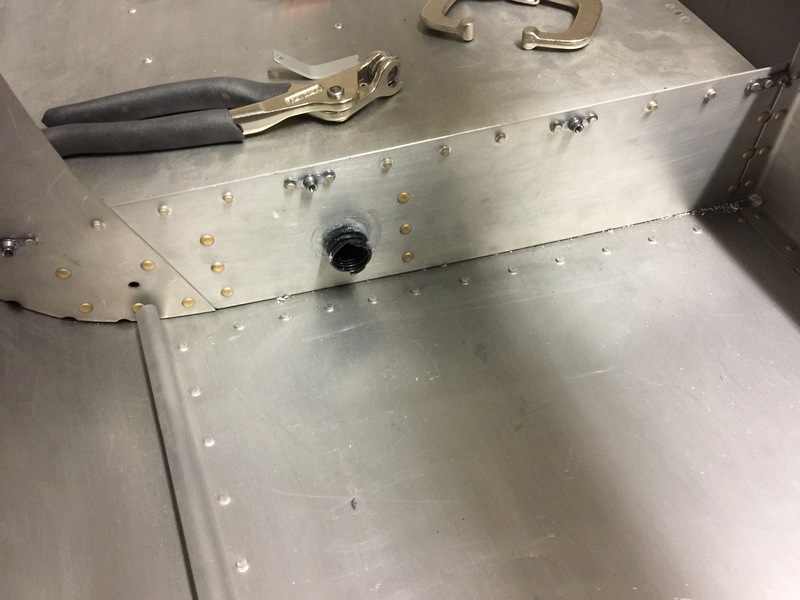 I installed it in the fuselage and installed the side panel covers to match drill the screw holes. 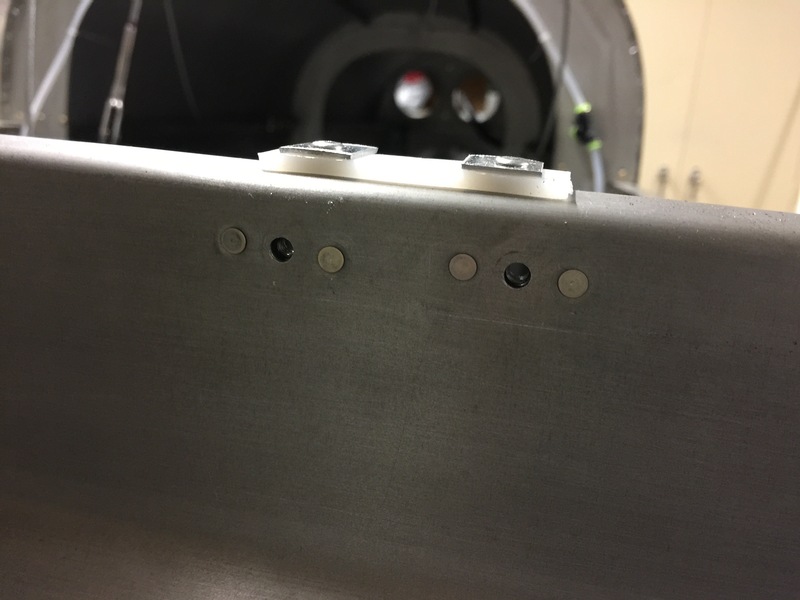 There are 4 screws that hold the covers to the forward and aft channels. I then decided to work on the baggage bulkhead and seatbelt cable pass-through. 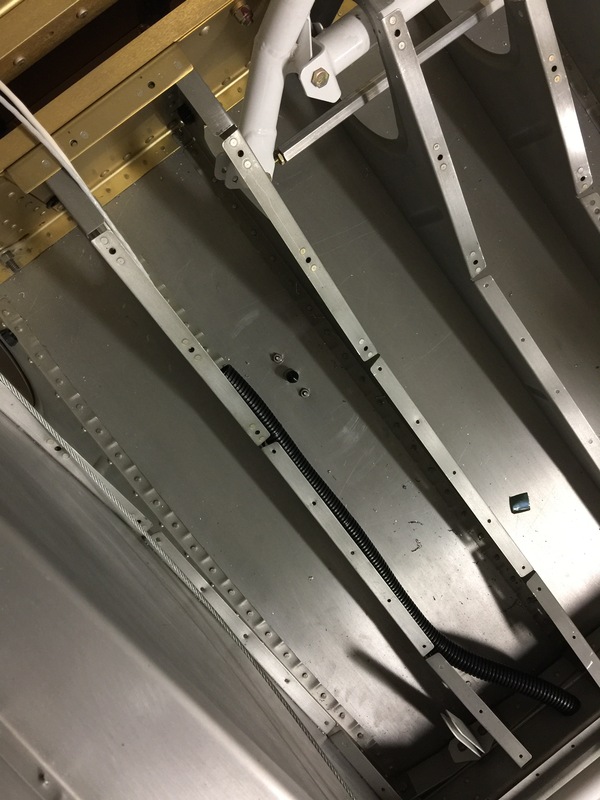 Here I’ve installed two nutplates that allow the top baggage panel to attach to the lower one where the seatbelt cable passes through. 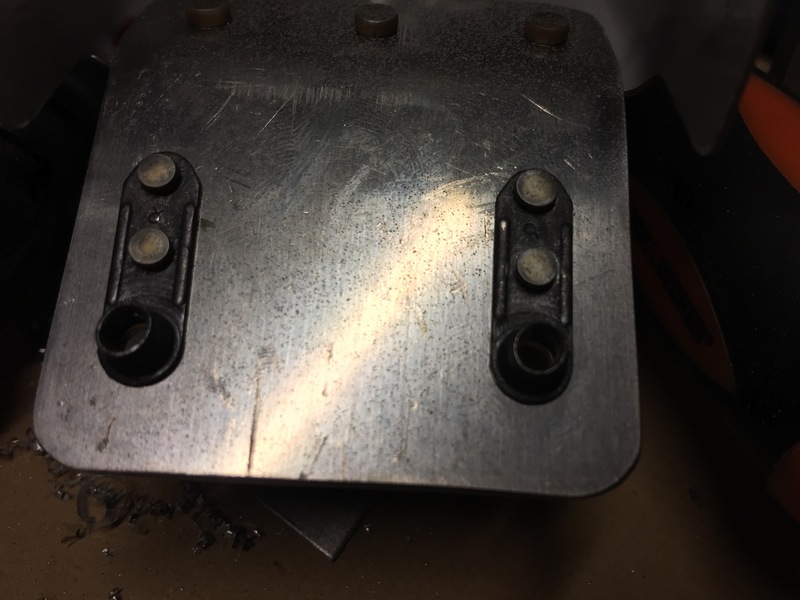 There are two plastic wear blocks that prevent the cable from contacting the aluminum. Here’s the top panel with the wear block riveted in place. Here’s the forward flap channel with the flap motor installed but not attached to the flap weldment. 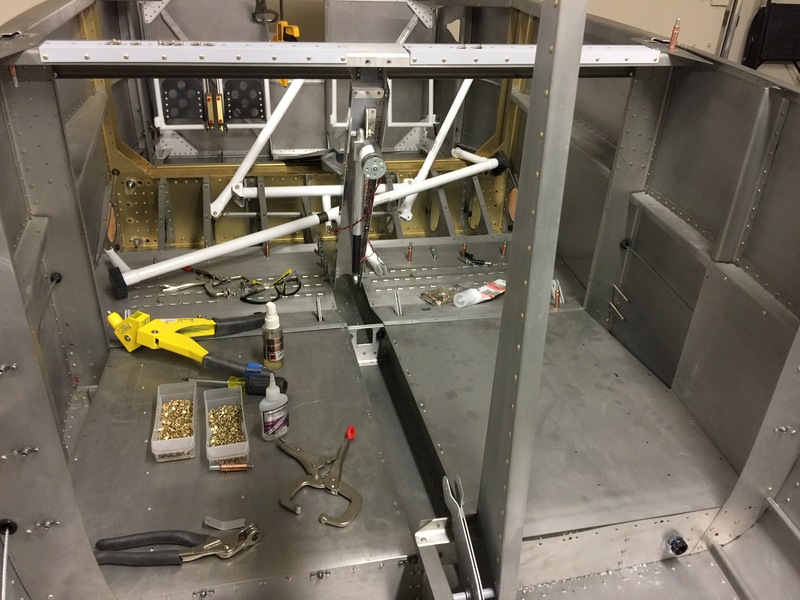 I’m waiting for an order from Aircraft Spruce with some components that I would like to install under the seat floors, then I will rivet the seats and the baggage floors in place. My goal for today was to get the flap motor mounted to the center channel that houses it. I started by drilling the holes in the motor arm to safety wire the bearing to the actuator. 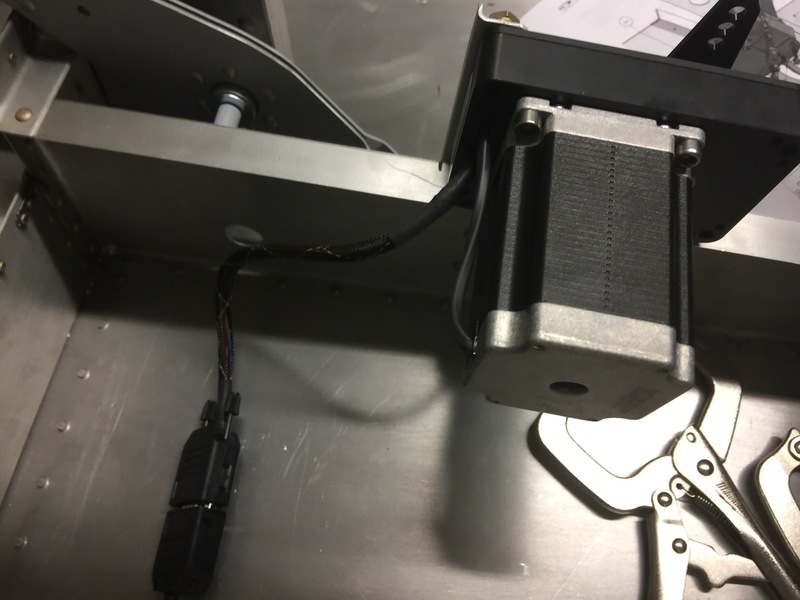 The motor uses a screw gear to raise and lower the flaps, and if this were to ever get loose it could back out entirely and the flaps would become loose. 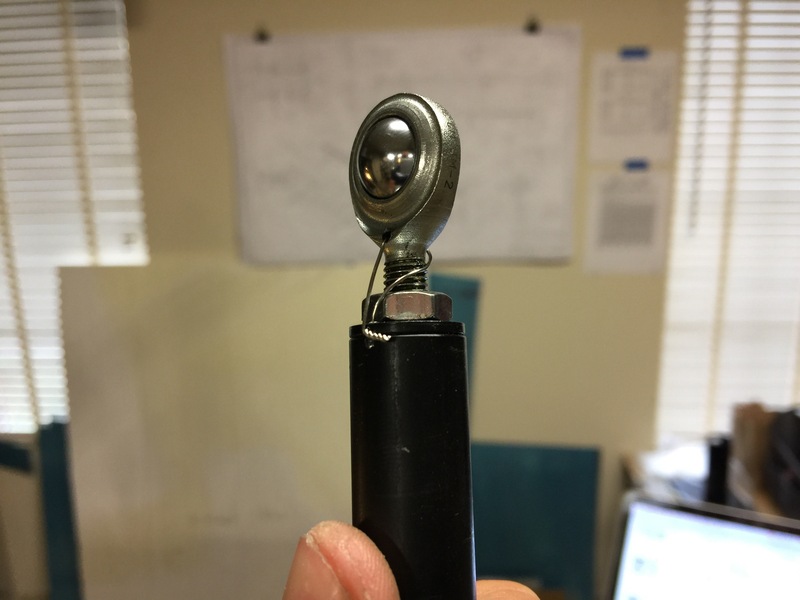 The safety wire prevents it from backing out. 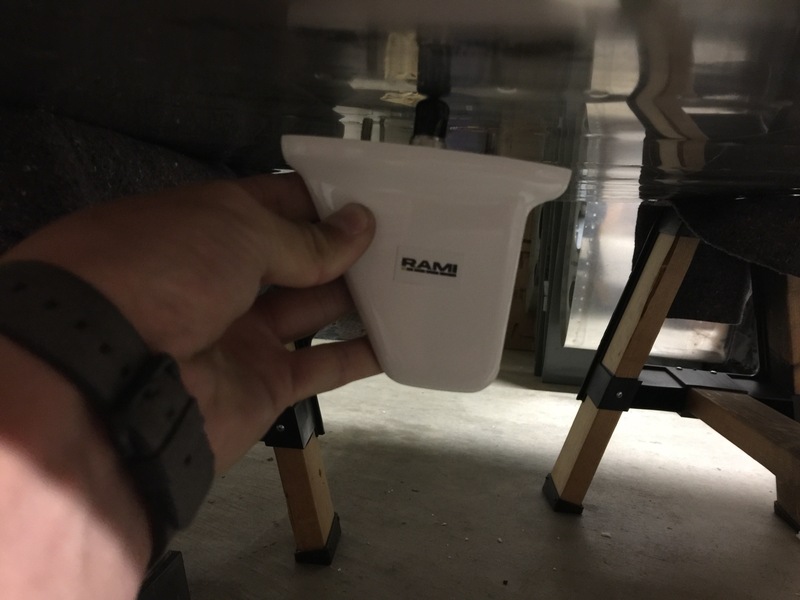 I the m fabricated the motor mounting angle bracket. 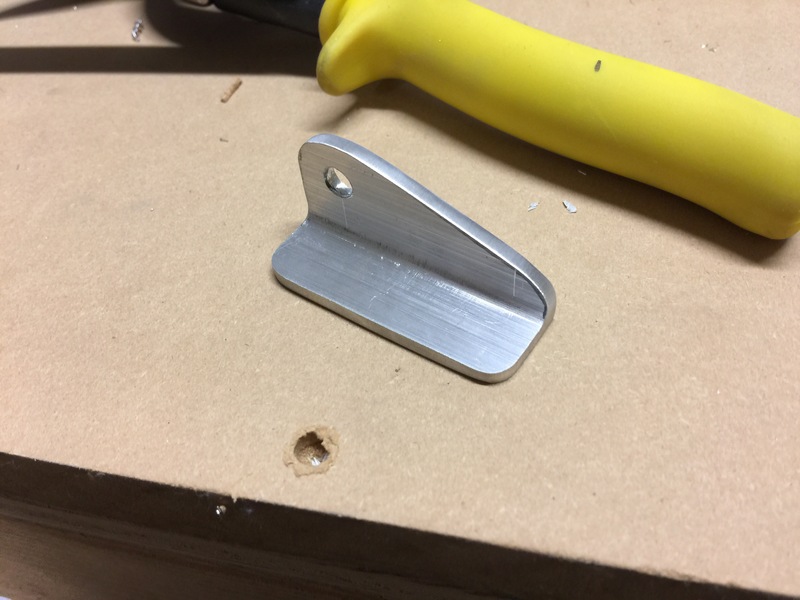 It’s made from 0.063″ angle stock. 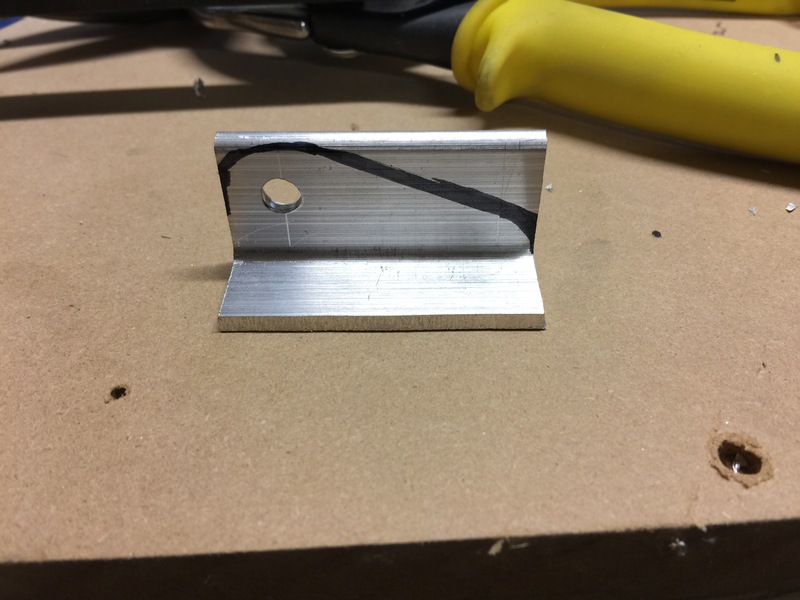 Here’s the finished angle with the 1/4″ bolt hole drilled. 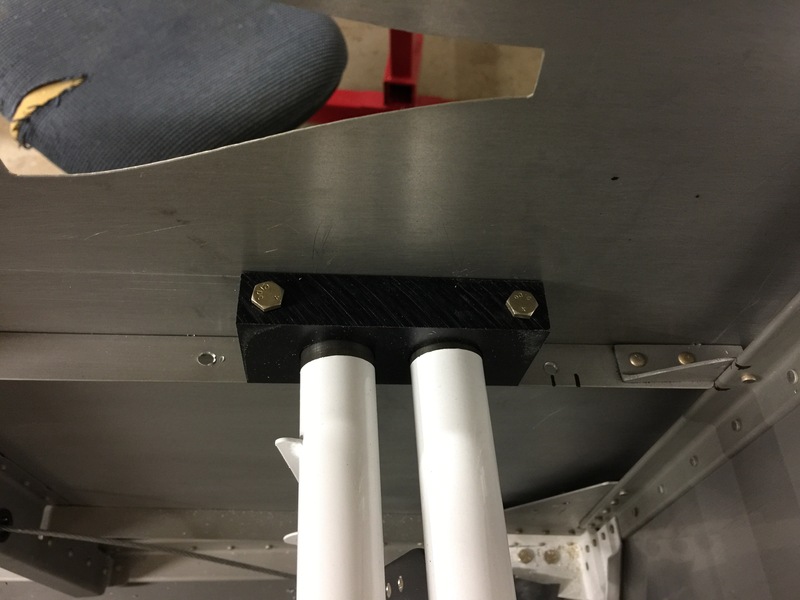 I also fabricated the other attach brackets for the center channel that allows the channel to screw to the floor and to the seatback brace. I also riveted all the nutplates that are used to attach the side covers. Here’s the motor installed in the channel after the mounting brackets were primed and riveted to the channel. I greased the bolt and installed the washers and cotter pin. This isn’t torqued down because it has to pivot when the flaps move. Here’s the bolt from the outside.